Ship Street, once a rather nondescript off-shoot off of Johnston Road, has welcomed in some glitzier (and delicious) tenants in recent years. With the likes of 22 Ships, Ham & Sherry, and now, Akrame, the narrow street has been transformed into a mecca for food lovers. 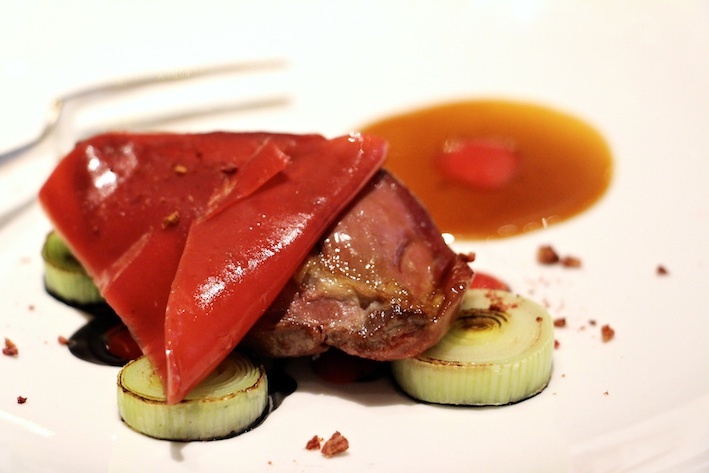 The latter, Akrame, a sophisticated 30-seater of fine French gastronomy, opened its doors in 2013. Washed in clean lines and muted greys and beiges, with flashes of photography art featuring tattooed models on the walls, Akrame is all modern French sophistication. The first venture outside of Paris by the French Algerian chef Akrame Benallal, the restaurant ethos revolves around a marriage between intuition and traditional technique. The menu is in constant motion, transforming on a regular basis based on the creative inspirations of Chef Benallal. The back of our menu card was a treasure map of scribbles, capturing the creative process behind the conception of each menu. Chef Benallal, who discovered his culinary destiny at the tender age of 14, has worked with culinary giants such as Pierre Gagnaire and Ferran Adria, before carving his own path with the opening of Akrame in Paris in 2011. Within the year, he was awarded with his first Michelin star, with a second star awarded in 2014. The opening of Akrame Hong Kong brings Chef Benallal’s unique blend of soulful French sophistication to Asian palates. We recently sat down to savour the new 8-course degustation menu on a blindingly hot Hong Kong summer day. Our meal started with a refreshingly cold soup of white asparagus, orange blossom and smoked haddock. The soup was blissfully light and effervescent, allowing the mellow sweetness of the white asparagus to shine through. 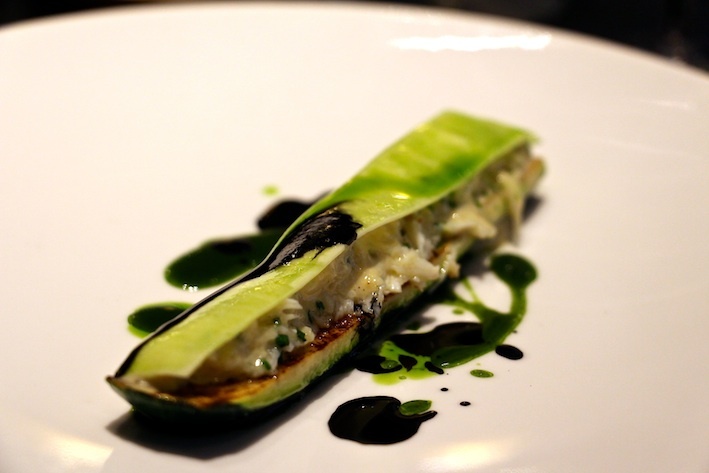 We then moved on to the zucchini and crab “lasagna” brushed in a brown butter and charcoal glaze. The tender, summer courgettes were succulently fork-tender, and paired well with the sweetness of the crab. The charcoal glaze tied in the mild flavours, and gave the overall dish a slightly smoky edge. 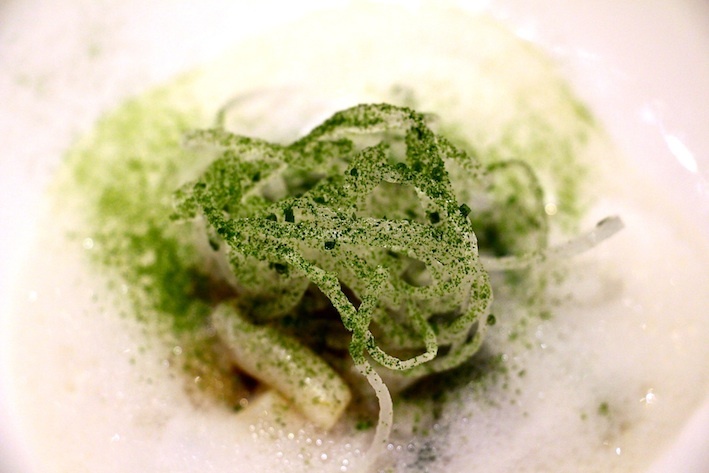 We then moved on to a gingery froth punctuated by juicy pops of razor clam and crunchy daikon. A common thread runs through these first three courses – clean, elegant, and light. 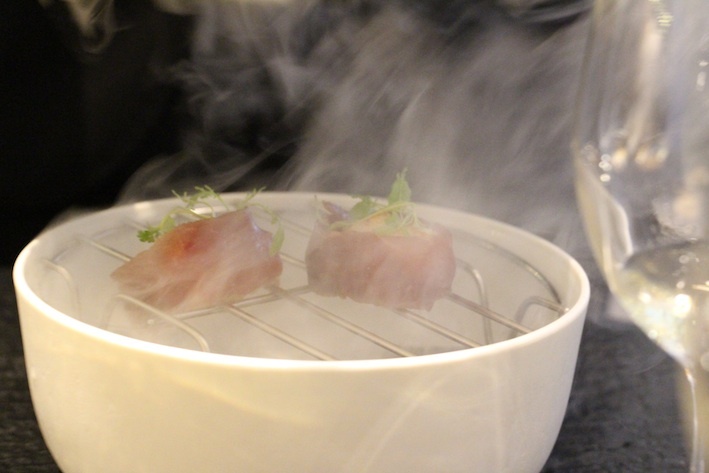 Aptly termed “Surprise” on our menu, the lobster smoked beef came to the table amidst much fanfare, encapsulated in a cloud of charcoal smoke. 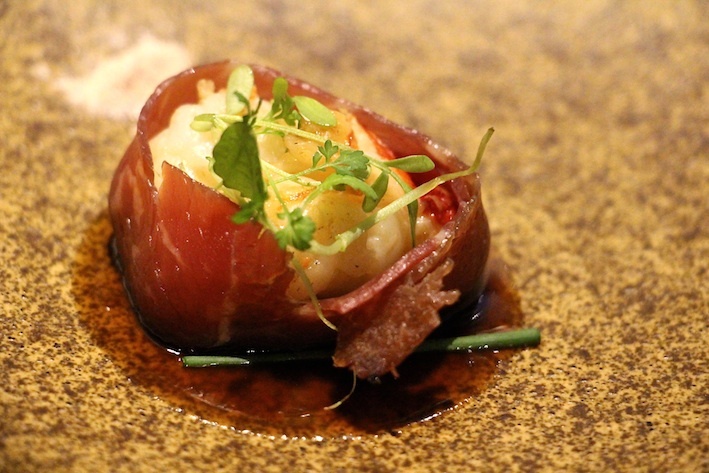 Each medallion of tender, bouncy lobster was wrapped in a blanket of smoked beef, a delicious contrast in flavours between the mild sweetness of the seafood and the robust savouriness of the red meat. The luscious, glossy beef jus coated each forkful, and gave a hearty glow to the, otherwise, light dish. The snapper with risotto and endives was beautifully seared, and the slight bitterness of the endives enhanced the creaminess of the risotto. In between the dishes and copious glasses of decadent wine, we stopped to savour a palate cleanser of basil ice cream. We then moved on to the heaviest dish of the meal - a succulent pigeon blanketed in raspberry jelly, served over grilled leeks. This was the highlight dish for me. The robust flavours of the game bird blended incredibly well with the sweet tartness of the raspberry jelly. Is it cake time? 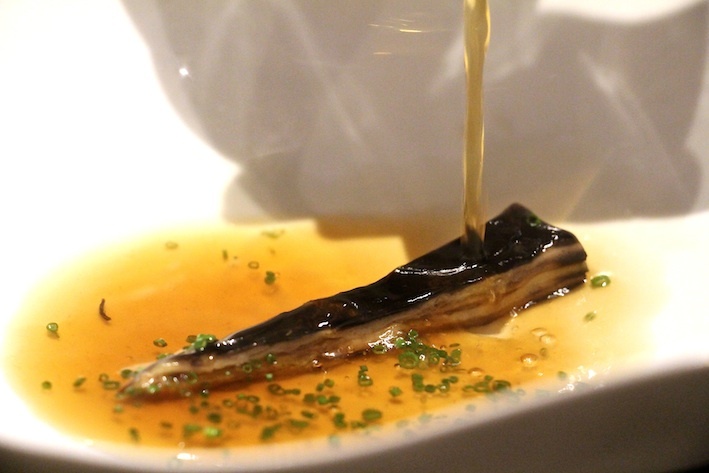 Slivers of what we thought were cake were brought to the table, and then a savoury mushroom consommé was poured over top. What?! What looked like cakes were actually layers of savoury Comte and mushroom - the umami mushrooms enhanced the briny nuttiness of the Comte. 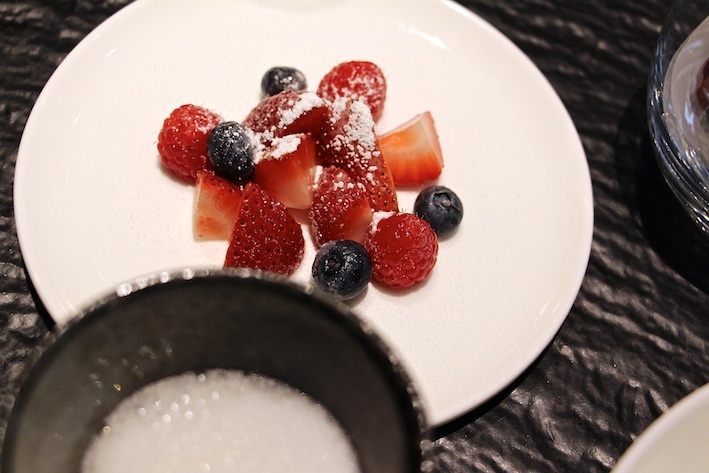 After our “faux” dessert, we come to our actual desserts of sugar dusted berries paired with an emulsion of honey lavender milk froth and ginger. A sweet yet light finish, perfect for the humid weather. Verdict: Precise, calculated finesse – a great deal of thought and culinary savviness went into this meal. 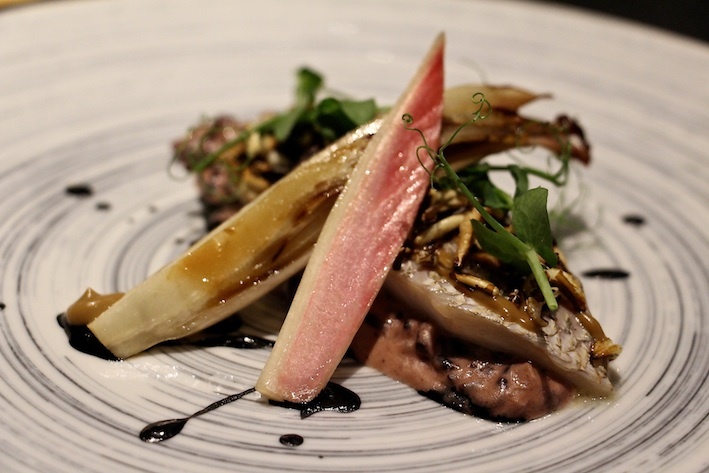 Our 8-course degustation menu left us happily satiated, rather than overwhelmingly full. An ideal place for a special occasion, rather than comfort eating. Degustation menu for lunch ranges from $280 to $788, depending on the number of courses offered. Dinner menu starts at $788 for a four-course degustation, and up to $1398 for an eight-course extravaganza.